Love was in the air this Valentine’s Day as Washingtonians ate out to fancy restaurants, exchanged romantic gifts, and…went to see Howard Schultz? The longtime Starbucks chairman and CEO dropped by Sixth & I to speak about his new memoir, From the Ground Up, with historian Doris Kearns Goodwin, a book-tour stop that came almost three weeks after Schultz told 60 Minutes that he is thinking about running for President as an independent. Maybe this is DC’s idea of a good date? Or maybe everyone here is single. Schultz delivered something that resembled a TED Talk mixed with a stump speech, touching on parts of his history mentioned in the memoir and fielding questions about his political ambitions. Among the scintillating things Schultz shared: He starts his day with two cups of French-press coffee (Starbucks beans, obviously). Oh. Schultz also doubled down on his vague message of centrism and fiscal responsibility, and insisted that he does not want to see Trump re-elected in 2020. Outside, a small group of protesters expressed their displeasure with his possible candidacy, accompanied by Carly Simon’s “You’re So Vain” and a mobile billboard with slides that included a fake Valentine from Trump. 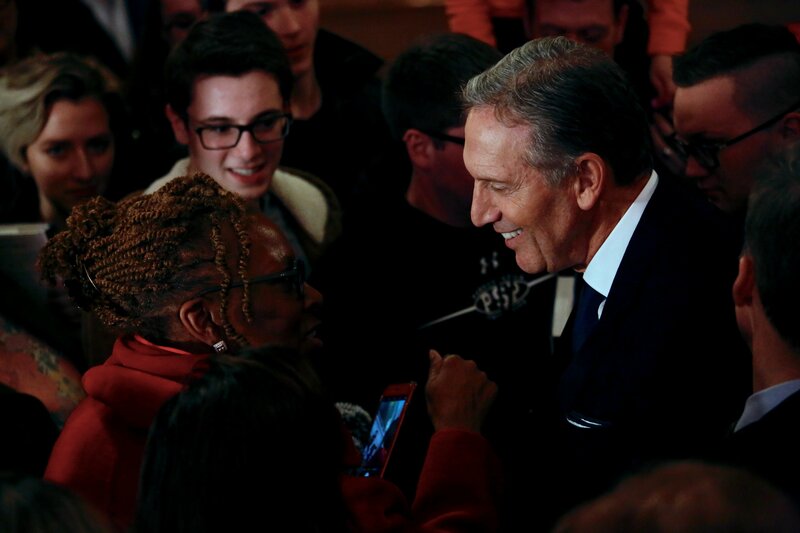 Howard Schultz chats with Dorri Scott, an educator and brand strategist, after his book tour stop at Sixth & I. Photograph by Evy Mages. Schultz told that audience that he is “seriously considering” a run for President in 2020, adding that he will make up his mind in late spring or early summer. Until then, he’ll continue hawking his book.